Looks to be a nice car. Do you know what the build date is on the driver's side door plate? Those wheels look very nice to me and somewhat rare here in the states. Here in Europe, the Z cars were sold without the date plate on the pilar door, I guess it's a January/February car, because it's vin in 23644, and the others sold here in Portugal after mine are second series and have higher vins. The previous owner was a famous football player and the had a crash in the middle 90's so they made some work to convert it...I guess. These wheels are special, the Kobe Seiko that came with the 432Z in Japan. Our european cars have some specific details, 5 speed gearbox, wheels, steering whell, spoiler and some others, but it only happen because our Z's are the "U" series. Thanks, soon we will start the metal work! Thats a really nice, rust-free example you've got there. Are they pretty rare in Portugal? Wasn't your car originally supplied with the glass headlight covers with metal trim ? What do you plan to do there ? Was it always light metallic blue ? Were they called enterpriso or enterprise spec cars? After the importers? My favourite spec of row cars though. If you happen to have a spare set of wheels for sale please let me know! Question: What was the full factory type code (including the suffix) of the official Portuguese market cars? You say it was 'U' code above, but is that correct? Was there another letter before or after the 'U'? 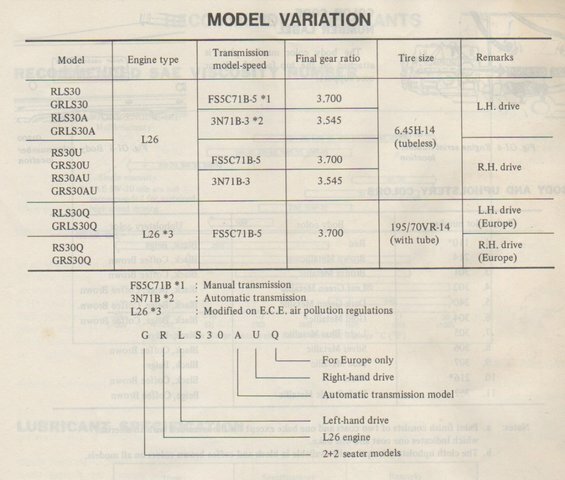 North American market cars were 'HLS30-U' of course, with additional letters after the 'U' if denoting special sub-models for particular markets ('HLS30-UN', 'HLS30-UV' etc), and main 'European' market models were 'HLS30-Q' (UK market RHD cars were 'HS30-Q') so what was the full official code for the official Entreposto-imported Portuguese market 240Zs? I really love the original Portuguese market cars. Great spec list. Good luck with the restoration! Wasn't your car originally supplied with the glass headlight covers with metal trim ? People often seem to mistake the OEM Nissan headlamp covers as being made from "glass". In fact they were made from Plexiglass. There was never any glass version. Thanks for the glass correction - I really thought that some were. Where does see these 'extra letters' because they don't appear on the titles, V5s etc nor have I seen them on the bulkheads, doorplates and dashboards (except for an 'x' at either end once that was even copied down onto the title doc) ? I knew i'd be wrong. 'Entreposto'. It's usually only found on factory documentation. Factory service manuals, factory parts lists, factory 'Service Shuho' booklets etc. uk66fastback - The 240Z in Portugal sold 139 from 1970 to 1973 and the last 240Z sold happened during May 1974. They are rare because in the last years people started to buy them outside Portugal, countries like Belgium, Poland, Finland they all come here and buy them. At this moment maybe 50 Z's are running in Portugal. Sean - Originaly my Z was grey, and the previous owner that was football soccer star playing in Futebol Clube do Porto (blue equipment) painted it light blue, this one from 73, but in the papers the car is grey. It's funny because I've many parts of the car painted in dark blue, the 903, That's the reason to change the colour. It will be cool. The Z's sold in Portugal during 1970 and 1973 did't have the glass cover, I believe that was an extra. nowadays we have 2 or 3 here with it but they all came from Japan a few years ago. Albrecht - All the portuguese cars are "HLS30 U", for example mine is HLS30U-23644, this is about the equipment they have. The ones from UK and US are like you said. I read long time ago that "U" cars were the ones with more extras, and that's funny because even in europe a few have the same extras as Portuguese ones. There is one detail that I can't confirm, but some told the deal between Japan and Portugal was made by one of the important persons in Nissan José Megre, and he choosed some extras for our market...I din't know if it's true, but make some sense. I'll post some photos from portuguese cars. So....you're putting it back to grey or keeping that lovely shade of blue that even your wife likes ? Usually, when the letter is in brackets in official Nissan documentation, it means 'where applicable'. Have you got any factory literature in Portuguese? In fact, did Nissan (or Entreposto) make special factory service manuals and parts list in the Portuguese language for the Z? That would be really interesting. Why haven't the HLS30 (non NA market) cars the suffix '-U' ? What differs the HS30-U (aside from the wheel on the 'wrong' side) from from the HLS30 ? Why haven't the HLS30 (non NA market) cars the suffix '-U' ? Because they are completely different models for different markets. For a start: Different engine settings (emissions eqpt...), different suspension settings, different transmissions, differential ratio, steering rack ratio, front ARB thicker, rear ARB present etc etc in comparison to USA & Canada versions. What differs the HS30-U (aside from the wheel on the 'wrong' side) from from the HLS30 ? A lot less than the HLS30-U vs HLS30 differences. The main one being - as you have guessed - LHD vs RHD. Sean - I will put the 903 blue, I guess the same as the presentation in Tokyo 69. My wife really love the colour, but I don't like very much...really!!! Albrecht - I read in a book, I'll search for it late at night, that mention that the "U" means equipment beyond the series, I really don't remember the book´s name, and in here perhaps was added special equipment to launch the car. But here in Portugal all Z's have this std specs. The literature on the model here in Portugal are only some normal papers used by nissan in europe, not any in Particular. They used the series advertises. I have some, I'll put some. And the series of model with extras that are different from countries. Later i'll put a series of images for you. Thanks Alan - so 'U' only denotes RHD ? The only differences between your list and cars imported here in France for example are the wheels and I still thought that most were imported fitted with PERSPEX light covers ? Also, in France we didn't have white reversing lamps in the rear light units.